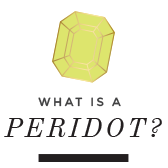 Today, I’m really excited to be able to give one lucky Peridot Sky's reader a slew of my favorite Valentine’s Day treats. You’ll get the most incredible pair of Stella & Dot earrings, a box of fabulously delicious Christopher Elbow chocolates, the sweetest "Be happy & do good" Ashley Brooke Designs mug, an Ostrich Rustic Cuff , a sweet set of note cards red le pen and pencil set from my dear friend at Carde Blanche, and a striped little note book for all your thoughts! It’s a celebration and it just so happens to be Valentines! I have mentioned here, and here, that my blog anniversary was January 1st. Two years of blogging. It has been a fabulous journey and I couldn’t have done it without you. Thank you! With the start of a new year… the ending of holiday season… and the resolutions and diets that commence, I knew I wanted to celebrate with you; after all you are important to me, on a day that was meant for love!! Can you believe this giveaway? I curated this grand collaboration just for you. Everything is dear to my heart and I hope you love it all as much as I do. Be Happy & do Good…yup… that's a great way to start your day! I have a weakness for cute mugs! I don't know why, but it helps to make a great start to your day I think! She has a mug that says "you can't sit with us" haha, the girls at the office and I have a joke about this and seriously need this mug! 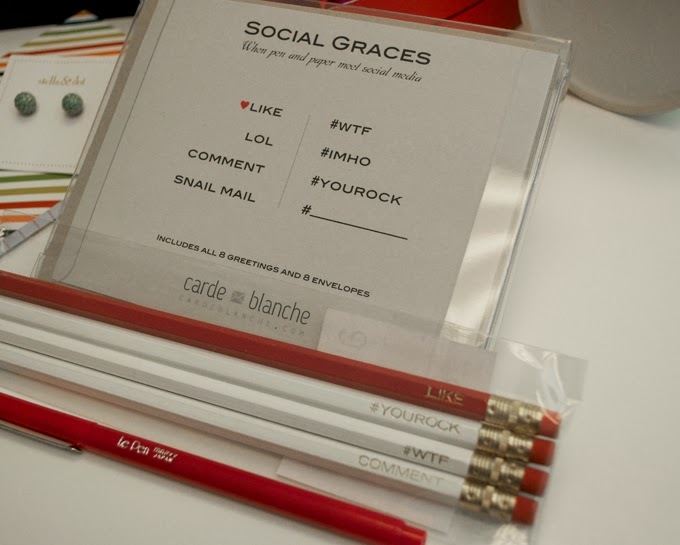 A lover of fine stationary like myself, Lori at Carde Blanche will work tirelessly with you to create the perfect custom order! She tends to every detail and has the cutest stationary and pens to choose from. Love it! If you have been following for very long then you know that I LOVE my bracelets and cuffs. 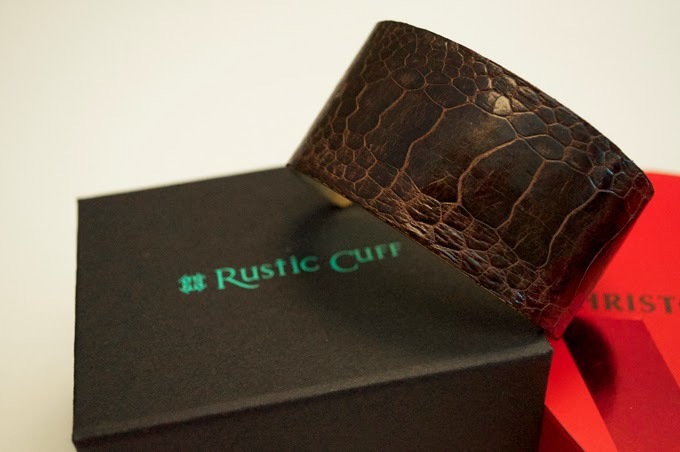 Rustic Cuffs are a favorite for sure. Jill is from my hometown in Oklahoma and I couldn't be more excited every time she launches a new line. I wish I could keep this one too! I have to admit, I only recently received my first piece of Stella and Dot. I don't know what I was waiting for but you can bet I will be adding more Stella to my collection. Have you seen the new collection? Adorable and lucky for me my dear friend Brooke offered to collaborate with me. 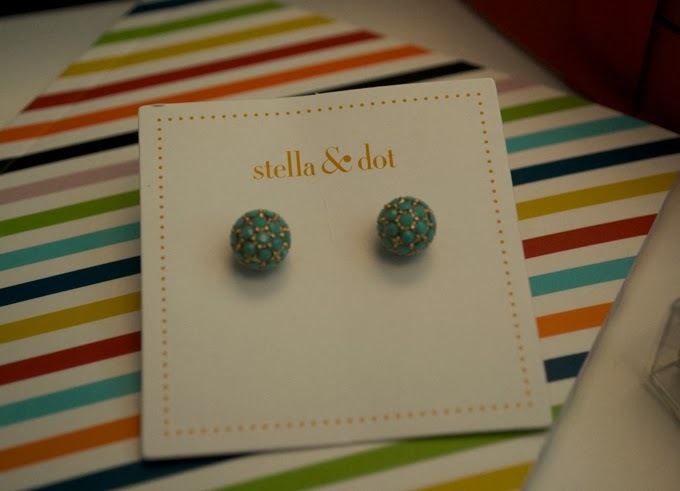 I chose these turquoise studs for you to win because they reminded me of a summer day by the pool. Another favorite of course! Oh my… last but surely not least…. 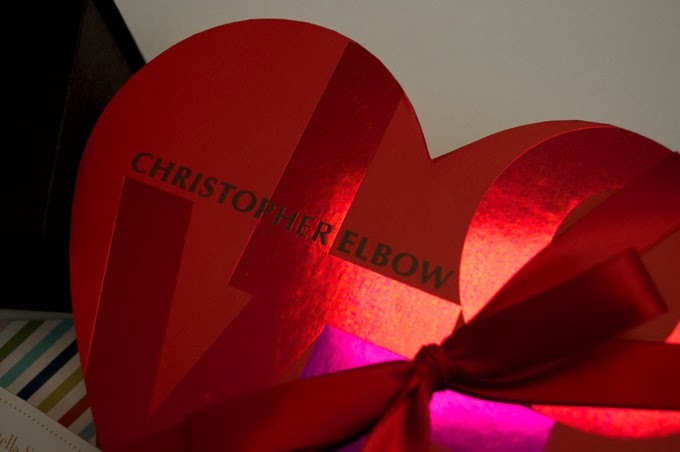 Christopher Elbow chocolates. The best! Just look at those scrumptious morsels! He is a local artisan and you will be hooked trust me!! My favorite Christopher Elbow is the 70%dark chocolate bars! Smooth and decedent! It's such a fun giveaway. Follow the instructions in the rafflecopter form below and good luck! Amazing giveaway, hope to win!! And My favorite item is definitely the mug!! Chocolates are always good... and if you win you must share! It's going to be so easy for you to deliver everything to me when I win. 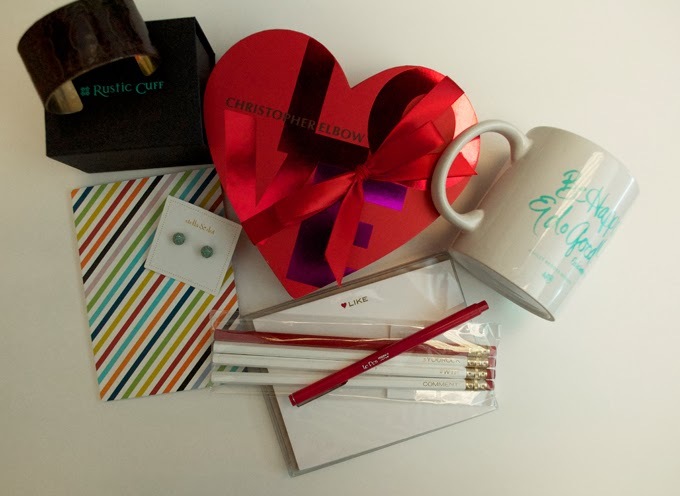 I *might* even share a piece of chocolate with you... :) Love everything but I think the Christopher Elbow chocolate is my favorite! What's not to love about these chocolates right? Good luck! Its super cute! Good Luck. Everything is great - but I would really like the mug to use at my desk. I love ABD and I've been eying that mug for awhile now! Great giveaway. Crossing my fingers I win! Good luck sent for you to win too! The chocolates are my favorite. The ABD coffee mug, she's my favorite! My favorite item is the Stella and Dot earrings! I love the turquoise color! Good luck! The cuff is my favorite! Pretty much my favorite too! Good luck! 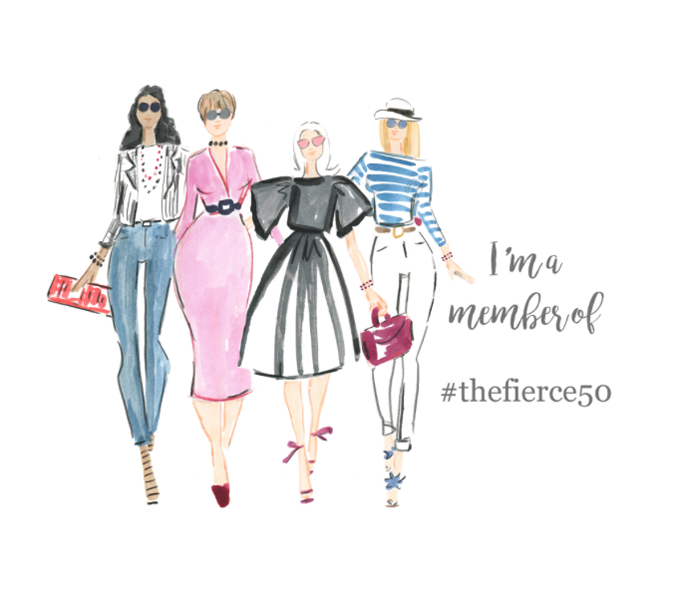 Congrats on your blog-aversary! You are doing great, keep it up! Thanks dear. Good luck and thanks for following along with me! It is a darling set too! Good luck! Haha... it is difficult I know! Good luck dear! It's a super cute one! Good luck. Being local you know what goodness those are all about! Good luck dear! My favorite item is the pair of earrings. Thanks! 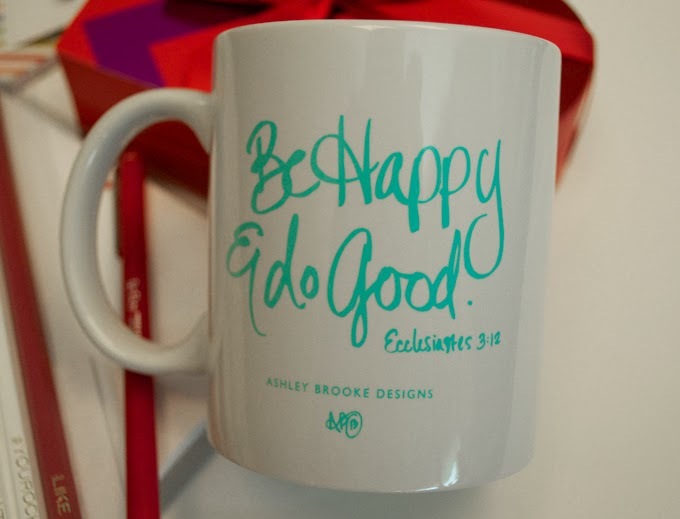 I love the Ashley Brooke Designs mug! I have another one of her mugs and it is fantastic! Thanks for the chance! That cuff, those earrings, and well... everything is pretty fantastic! Thanks for hosting! How fun!